It seems to me that question 1 part c) doesn't ask any question and instead makes a statement. Is there anything I'm missing there? for part a, should we add a condition that alpha and beta are real? Or they have to be real since we are assuming all eigenvalues are real? Right, I put it explicitly. Thanks for checking and asking questions (on behalf of everyone). What does OX stand for? For X_n expression in a), if why don't we have w_n in front of the cosine, instead we have w? Also for e) can we assume there are no degeneracy in the eigenfunctions/states? Otherwise they would be orthogonal with equal eigenvalue. Hi, I have a question. To solve this question, should we substituting the Xn given into the initial conditions to justify whether it is right ? Or we just use the initial conditions to get the 2 equation given in the problem? Since we have two conditions (one at each end) we call them boundary conditions. Therefore, the eigenfunctions corresponding to different eigenvalues are orthogonal. You may assume that all eigenvalues are real (which is the case). & Y_n(x) = \gamma_n \cosh (\gamma_n x) + \alpha \sinh (\gamma_n x). 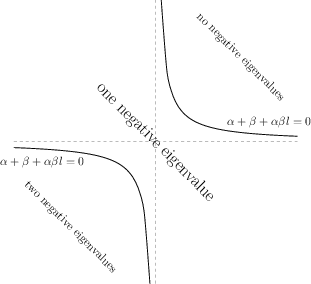 Check above arguments and justify that in the described zones there are really no, one, two negative eigenvalues respectively. where we consider now all eigenfunctions (no matter corresponding to positive or negative eigenvalues). (e) Bonus Prove that eigenvalues are simple, i.e. all eigenfunctions corresponding to the same eigenvalue are proportional. Thanks for parts a b d above. As no one has posted part c yet, I just post solution attached.